Opening shots of city crowds. 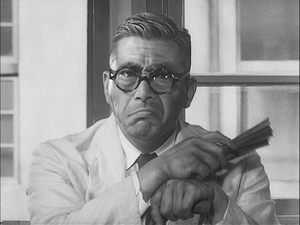 Toshiro Mifune as the determined patriarch. Dr. Harada arrives at court. The family outside the courtroom. Deep focus in Kiichi’s interview with his mistress and daughter. Kiichi’s panic at a flash of lightning. The core family at home. Wide shot of the factory. Nowhere does historical memory have more relevance to the present than in Hiroshima and Nagasaki. [open endnotes in new window] Writers as diverse as French philosopher Jean Baudrillard and Japanese Nobel laureate Kenzaburo Oe have commented that the dates of August 6 and 9, 1945, forever altered our understanding of what it means to be human, in that humanity can now envisage its own, permanent obliteration along with that of most life forms on the planet. Even if all nuclear weapons were to be abolished, they cannot be un-invented—the contemporary, and perhaps last, phase of humanity is a nuclear one. The understanding that the “atomic age” entails fundamental changes in perception did not come all at once in 1945. Indeed the conceptualization of our new situation is still evolving. The initial victims at Hiroshima and Nagasaki had no words at first for the destruction in one flash of their entire communities. The A-bomb dropped on Hiroshima at 8:15 a.m. on August 6, 1945, exploded 600 meters above the center of the city and released the equivalent of 16,000 tons of TNT, creating an enormous fireball 100 meters wide whose temperature was as hot as the surface of the sun; the shock blast flattened the city. Some 90,000 to 166,000 died instantly or in the following days due to burns and radiation exposure. In addition the atomic fission released lethal doses of radiation that killed thousands more over time, including those who went to the city within days of the bombing to search for loved ones. The devastation in Nagasaki was similar. In the aftermath, as the Japanese endured occupation by the victorious U.S. forces until 1952, public discussion of the bombs was prohibited. The Atomic Bomb Casualties Commission set up by the U.S. forces conducted research on the effects of the bomb on the population but did not offer treatment. A report was not published until 1956. At the same time, the Japanese government also discouraged discussion of the bombs and the subsequent Japanese surrender. There was thus a period of official silence about the human suffering brought about by the bombs. In addition, survivors faced discrimination within Japanese society and therefore were often reluctant to talk of their experiences. Survivors or those exposed to radiation after the blast often bore scars from the burns on their faces or the rest of their bodies. Many of them suffered from excessive fatigue and were considered undesirable as workers. Several women who had been pregnant at the time of their exposure gave birth to abnormal children. Girls who had been exposed were judged to be unsuitable marriage partners lest their children be similarly afflicted (to some extent this continues in Japan today, as people fear that the genes of exposed victims and their descendants might be damaged). The Japanese term “hibakusha” refers both to those who survived the immediate effects of the bomb as well as those who were exposed to radiation afterwards. In 1954 the U.S. H-bomb test on the Bikini Islands created new victims of radiation exposure. This included islanders who were forced to evacuate as well as 10,000 Japanese fisherman and their catches. The case of the crew of the “Fifth Lucky Dragon” fishing boat, whose members came down with radiation sickness from the blast, was a wake-up call. This event, more or less coinciding with the end of the U.S. occupation of Japan and following the renewed threat of atomic bombs being dropped on populations during the Korean War (1950-53), brought the concerns of hibakusha to the front lines of public discourse. Some 10 years after the initial bombing of Hiroshima and Nagasaki, the impact of those events on the collective memory of Japan—and eventually the world—finally began to take shape. Sixty Japanese organizations, including women’s, labor, youth, and hibakusha groups—with a total of 2.5 million members—came together to form the Japan Council against A- and H-bombs (Gensuikyo). During the Second World Conference Against A- and H-Bombs held in Hiroshima in 1956, Hibakusha organizations from prefectures all over Japan joined to create the Hidankyo, or Japan Confederation of A and H-Bomb Sufferers. Hibakusha came forward to demand compensation and medical treatment from the Japanese government. Collective memory interprets the past with a view toward the present. Although, as J. Samuel Weber argues, “there is no sure method for ascertaining what constitutes collective memory on any given topic,” still we can examine writings, images, and films to see how Japanese society has processed the experience of Hiroshima and Nagasaki across time, along with significant shifts and changes of emphasis. Hersey’s eyewitness narration (based on interviews with survivors) anticipated the hundreds of autobiographical survivor testimonials that have since been collected by Hidankyo and other organizations. The testimonials personalize and authenticate individual suffering and in doing so contest the reduction of the thousands of victims to mere objects in a military operation. They seek to convey an understanding of the catastrophe on a personal level that makes it comprehensible in terms of family, community, and national culture. Individually they assert themselves as private persons, above and beyond their “hibakusha” status. Retrospectively they argue for resistance against the recurrence of such bombings anywhere in the world by detailing the bombs’ effects, both immediate and long-term, on the victims. At the same time, survivors have often declared factual eyewitness reports as well as documentary films inadequate. What these accounts and films leave out are the psychological dimensions of the bomb’s aftermath, and the complex negotiations around identity that every survivor had to deal with in the post-war society. Instead, the works, literary and cinematic, that best communicate the multi-layered and complex identity negotiations of the hibakusha have come from Japan’s literary writers and filmmakers. 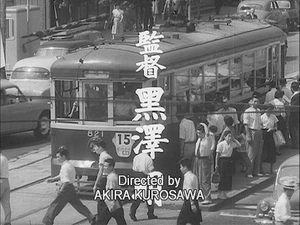 The films include Shohei Imamura’s Black Rain (based on the novel by Masuji Ibuse), Akira Kurosawa’s Chronicle of a Survivor, and Kiju (Yoshishige) Yoshida’s Women of the Mirror. The literary works are numerous; they encompass The Crazy Iris, a collection of short stories edited by Kenzaburo Oe; The Bells of Nagasaki by Takashi Nagai; The Devil’s Heritage by Hiroyuki Agawa; and hundreds of stories, poems, and literary essays. 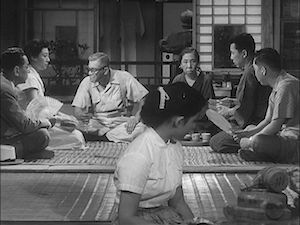 The three films by three of Japan’s most prolific and talented directors allow some periodization of Japanese collective memory. 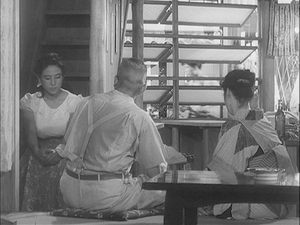 Akira Kurosawa’s Chronicle of a Survivor (Kimono no kiroku, 1955) focuses on the still unprocessed trauma of the bomb. His protagonist is a patriarch and factory owner who is obsessed with a plan to move his entire family to a farm in Brazil—his wife and legitimate children as well as two mistresses and three children born out of wedlock—where he thinks they will be safer. The film was made in the aftermath of the Bikini Islands H-bomb test that revived Japanese fears of radioactive contamination. Shohei Imamura’s Black Rain (Kuroi ame, 1989), made a full generation after Kurosawa’s film, addresses the effects of radiation sickness and the pariah status of survivors in Japanese society. 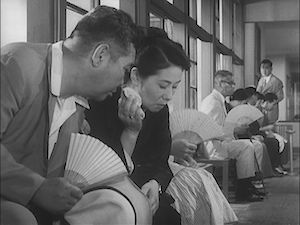 The fear of contamination is a recurrent theme in works that deal with the difficulty that young women faced in finding marriage partners if they were exposed to radiation from the atomic bombs. This film came out at a time when most hibakusha were old enough to have safely married off their children and could come forward to claim their rights as survivors without visiting discrimination on their families. Finally, Kiju Yoshida’s film Women of the Mirror (Kagama no onna tachi), made in 2002, is evidence of the continued contemporary relevance of questions of identity formation around hibakusha (survivors) and their children. The film also addresses the issue of amnesia around the atomic bomb, and the way that memory suppression can wreak havoc in individuals and society. Chronicle of a Survivor came out in the same year as another film about atomic trauma—the monster sci-fi fantasy Gojira (Godzilla). 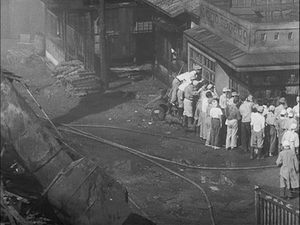 Unlike Kurosawa’s film, which can be seen as a “working through” of survivor trauma, Gojira fixates on images of pure terror as the helpless population is pummeled by an immense and uncontrollable force. 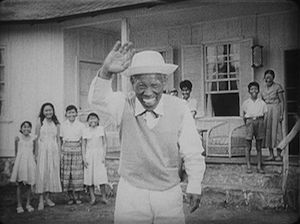 In Kurosawa’s film, the story of Mr. Kiichi Nakajima is presented through the eyes of a narrator, a circumstance that helps to reframe the narrative in its broader social context. 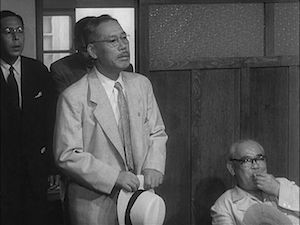 Kurosawa introduces the narrator through the device of a court case being brought against him by his own family for incompetence and fiscal irresponsibility. The narrator is a dentist, Dr. Harada (Takashi Shimura) who has agreed to be a mediator (with two other judges) in family court cases. The doctor offers spectators a way to identify with a character in the narrative, a point of view that offers a degree of objectivity. Ultimately, Dr. Harada is convinced by the three other judges to side with the family; but later he comes to regret the decision. His hesitation opens up areas of uncertainty for the spectators, who are thereby encouraged to weigh the evidence against their own feelings and opinions. 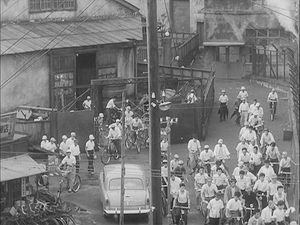 Visually, Kurosawa suggests through framing and mise-en-scène that the trauma of the A-bomb is one that marks the whole society. The first shots of the film are of crowds and traffic, without picking out any individual. Kiichi’s interview with his older mistress and her grown daughter is shot in deep focus, as people unrelated to the drama cross back and forth behind the apartment window. Repeatedly the factory itself is shown in wide shots, bringing the individual family drama into the space of the workplace and suggesting the effect the move would have on others. 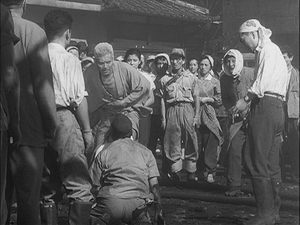 When Kiichi actually burns his factory down to force the family’s decision, Kurosawa directs our attention to the workers who have now all lost their jobs. 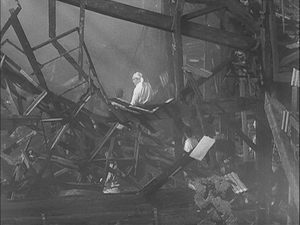 Here also the director inserts an image of the burned factory that would have memory resonances for the victims of Hiroshima and Nagasaki. 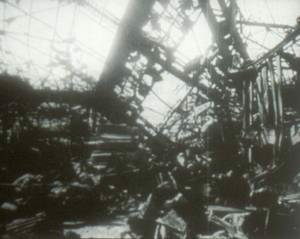 A shot of Nagasaki’s obliterated Mitsubishi plant taken by a Japanese camera crew after the bombing (and sequestered for 20 years by the US authorities) bears a remarkable resemblance to Kiichi’s destroyed factory. After Kiichi is committed to an asylum, the deep focus continues as Dr. Harada interviews the psychiatrist who is caring for him. In the back, the director has posed other patients in ways that memorialize the well-known iconography of the A-bomb victims. 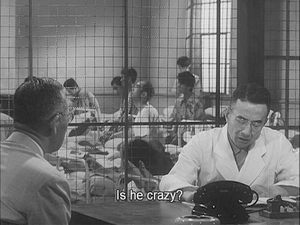 Visiting the patient in his cell, Dr. Harada learns that the deranged hero now believes himself to be on another planet. He imagines that the sun outside his window is Earth consumed in a conflagration. Here the director positions the spectator alongside Dr. Harada as a witness. 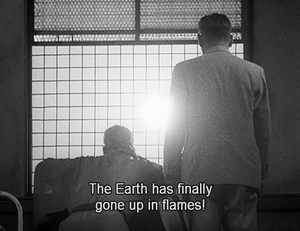 He is shown from the back looking out the window in silence with the bright sun between him and Kiichi, who erupts in grief at what he believes to be the destruction of our planet. The point of view of the “madman” and the objective judge have become one. Seen this way, the frame story of the court case can be seen as one that places spectators in the position of weighing the family members’ individual concerns over the anxiety of the patriarch who wants to disrupt their way of life. 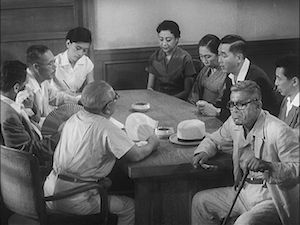 Here again, Kurosawa uses spatial relations between the different branches of the family to articulate the complexity of their relations—there is argument about who is the family “core” (admitted to the court proceedings) and who is on the “fringe” (the mistresses and their offspring, but also the husband of the legitimate daughter); who has the authority to speak for others (the eldest son) and who is spoken for (the daughters and the mother). Spectators may also wonder at the wisdom of sequestering all the moving parts (the “core” family and the mistresses with their offspring) in the same remote farmhouse in the Brazilian countryside. Kurosawa’s strategy is not to raise any of these questions directly. They occur to the spectators who are presented with scenes of the family drama without commentary. Instead, the film, in the fashion of Brecht’s epic theatre, encourages spectators to think about their own vulnerability and their own complex networks of attachments that prevent radical changes to their living arrangements.